There is no way around it. Puppies and dogs need to visit the veterinarian. And, for certain pups, visit the groomer as well. The process can be quite stressful—on both ends of the leash! Photo courtesy of Laura Monaco Torelli. "Oh boy, it's that time of year again. Vaccinations. UGH!" "Our dog needs a good grooming. But just getting through the door is quite the challenge." The good news is that a little bit of training time each day can turn the most dreaded visit into a pleasurable experience for all. My training and animal care background is with marine and terrestrial animals in aquarium and zoological programs. Daily animal care includes husbandry programs that are part of everyday management and planning. 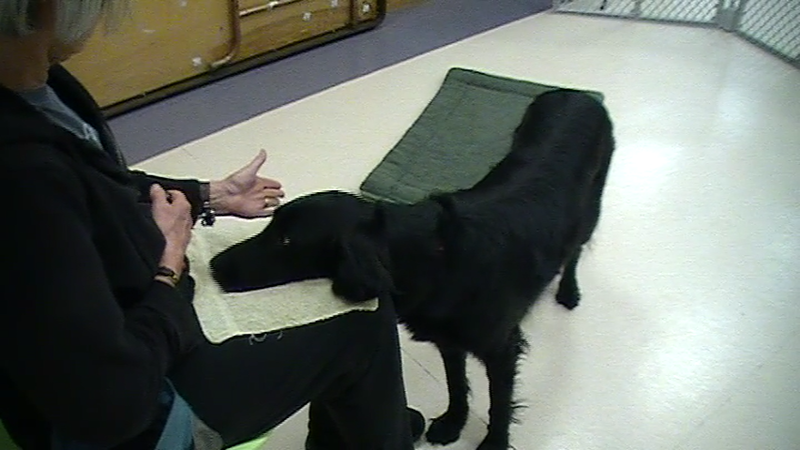 Teaching each animal to participate cooperatively in health care is a part of every training session. We "practice for the exam" day after day, session after session. We try for fun sessions that include small approximations toward the goal behavior so that when the veterinary staff needs a weight or blood sample, we are ready for the exam. And when I say "we," that means the animal and the trainer! Working with exotic animals in established programs has many training benefits: trainer consistency, set training schedules and sessions, a closely monitored and healthy diet, detailed record-keeping that lends itself to spectacular planning. But, how do professional trainers help the average dog owner who simply wants less stressful health care and grooming? Surprise—a little planning goes a long way! At the start of any program, I meet with the client and we assess together what the goals are for the dog. Some clients have more time for training than others. Some clients are looking for the basics, and some want their dogs enrolled in each and every available class. No matter how many training service(s) a client signs up for, the dog will be experiencing vet and groomer services countless times. eye drop behavior in a group session. In group classes we practice and demonstrate vet and groomer behaviors with new student dogs, keeping it fun for all. We also invite our advanced dog/owner teams to our group sessions for "Show and Tell" games. New clients can see just how much progress they can make when they dedicate a little bit of time each day to their own training plans. Our Ready…Set…for Groomer and Vet! program is located at Furnetic Chicago Center for Veterinary Medicine in Chicago, a fortuitous choice. We hold some of our group sessions within the lobby and exam rooms of the clinic. When clients see that a "Happy Vet Visit" can be painless, that a visit can be completed within a short time interval, and that the clicker and treats are used simply and fluidly, they are empowered to carry the games to their own veterinary office. Furnetic is an extension location of the University of Illinois at Urbana-Champaign College of Veterinary Medicine. We benefit on so many levels from inviting veterinary students to observe and assist with our group sessions. 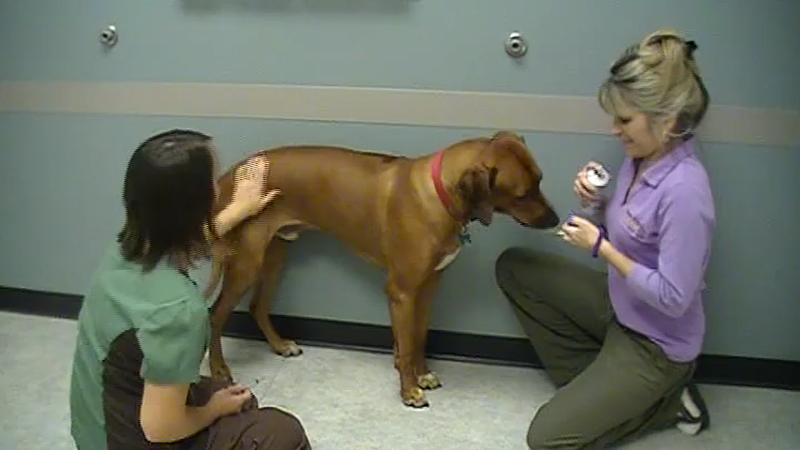 The veterinary students benefit from observing this proactive program as part of their continuing education. A few months ago, I wrote a blog for KPCT about this program. The blog contains some additional suggestions that may be helpful. Planning ahead and inviting veterinary and grooming staff to help builds in successful successive approximations to training plans. It does take a village to train and care for a puppy or dog! Having a village of veterinarians, vet technicians, groomers, and support staff helps owners and dogs build on success with their training goals. Be aware that a pup's paws can get hit by a door when it is opened, depending on the dog's paw placement at the time. If this happens just as a dog walks into the vet or grooming location, the association of paw pain from the door is made right in front of a location that may already have stressful associations! Give paws some space and provide delicious treats when you walk your pet through significant entryways. For professional trainers, teaching cooperative medical and husbandry behaviors is almost second nature. Professional trainers teach these behaviors day in and day out and are remarkably fluent with an impressive skill set. Naturally, professional trainers achieve what the average dog owner would define as simply extraordinary. "How in the world did you teach my puppy to walk onto the scale so fast? He never does that for me. Wow!" Show and tell activities and group sessions open the door to teaching owners how to train their puppies to perform the same behaviors. "Now that you see how much progress has been achieved in a one-hour class once per week, imagine how far you and your dog will advance with your goals if you practice a little bit each and every day!" Teaching clients simple foundation behaviors yields skill sets they can take anywhere. Early valuable skills include: cuing basic and follow hand targets, settle on a training mat, name recognition, standing on various surfaces, offering paws, oral tactile, body tactile, stepping onto platforms, and more. The beauty of training is its foundation in the basics. If an advanced behavior falls apart, there is the initial shaping plan to refer back to. Going back to the initial step of a behavior is useful in many cases, even just to increase the general comfort level of the dog and/or owner. Many times trainers have seen a dog become quite nervous when the dog is asked to step on to a scale or is lifted on to a grooming table. But when the rate of reinforcement and primary reinforcement value (i.e., high-value treats in most cases) are increased, distance from the scary scale or table provided, and simple foundation behaviors cued, you can literally see the dog relax. It's as if the dog is saying, "Whew! I know those behaviors. Thanks for helping me out. You are the best!" Small steps toward incremental success points should be the foundation teaching mantra. Sometimes in training, less is more! position, while enjoying reinforcers on the front end! One of my favorite ways to help clients be successful with husbandry behaviors is to show them how to train those behaviors while working on other goals. Training is not just about obedience or single, discrete goals. There is a broader scope to most training goals. It is helpful, however, to teach owners how to split goals into small steps. Most owners see the value of this strategy when small successes lead to larger progress over time, in this case at each subsequent vet and grooming visit. I am primed to notice the smallest sign within canine communication that indicates that a dog is becoming stressed by a husbandry behavior. There are ways to manage this stress and to continue to train, all the while keeping the dog (and client, if necessary) relaxed and below a certain threshold of stress. One simple option: cue fun tricks and easy basic behaviors in between trimming a dog's nails, cleaning a dog's ears, or brushing a dog's coat. Another way to provide a training support system for clients? Give them the goal of practicing basic husbandry behaviors in various locations away from the vet and groomer. Work on the general fluency of the behaviors elsewhere; variety is the spice of life! We have clients practice for "the test" before they go live! One option is to show friends and family their teamwork. Even better is to ask friends and family to play the role of vet or groomer and join in the quick training activities we practice in class. Our clients get reinforced by friend and family feedback. Clients can travel to the veterinary and grooming locations for fun visits, too. It takes time to build trust back into a stressful location. The better bet is to build a positive association with a location like the vet office ahead of time. a vaccination with lots of treats and low stress handling! There are many trainers, veterinary hospitals, and groomers that teach low-stress handling and care for animals and their owners. An excellent resource for those techniques is Dr. Sophia Yin's website. There is also her amazing book, Low Stress Handling, Restraint and Behavior Modification of Dogs and Cats. A recent training referral came to me from colleague Laura Dorfman. She received a training inquiry from clients moving to Chicago with a four-month-old puppy. When I met with the clients, they showed off the many wonderful behaviors that their pup had already learned. They also put me in contact with their original trainer, Hedda Garland; we had the pleasure of talking about the fun behaviors she taught the owners and their new puppy. 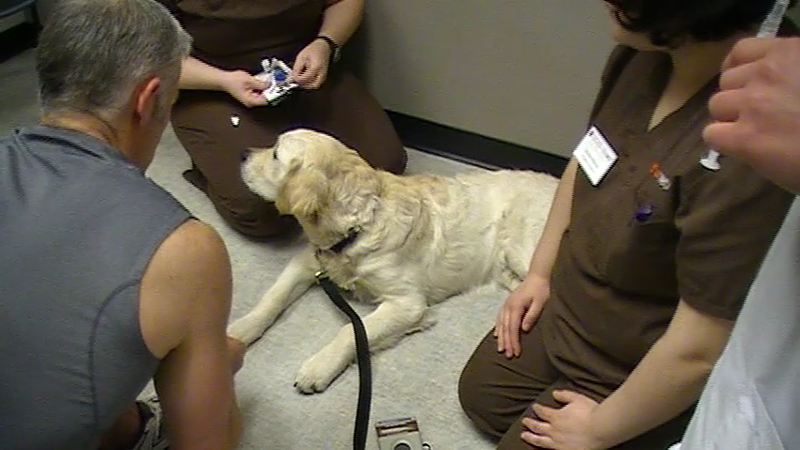 One of the behaviors that we took to the next level was the dog's "relax" behavior. He would lie on his right side when given the cue. We have since taught him to lie on either side on cue for general training and care. I also started bringing the dog for happy vet visits to Furnetic, which came in very handy when it was time for him to be micro-chipped and to receive standard vaccinations. Being involved with day-to-day training progress is quite reinforcing. Teachers have such amazing roles! Providing tips, suggestions, and resources that help our veterinary and grooming colleagues also creates relaxed clients and dogs that reap their own benefits. Just another day in the life of a positive trainer! When we receive a private and thoughtful note from a client, trainers take a step back, look at the bigger picture, and appreciate that we are a part of the change our clients want to see in their dogs' worlds. Here's a recent and favorite "treat" I received. Animal Behavior Training Concepts classes are such a unique combination of state-of-the-art instruction and just good old fun that it's easy to forget that they are teaching us how to bond with our dogs, how to show off our dogs, and how to keep our dogs healthy. How many times has your dog needed a pill, eye drops, or ear drops and you can't treat him because you haven't practiced the behavior? Your clients will not have that happen; your clients are prepared! We have so much fun practicing these behaviors that we don't even know that others might fear them." — Pat T.
The bottom line is that veterinary and grooming visits are quite stressful for some dogs. There are ways to assess anxiety and reinforce less-stressed behaviors. The results are overall improvement in feelings and atmosphere and continued progress toward new goals. Trainers should keep up proactive training. The goal is to help clients and their magnificent dogs create and train easy plans that equate fun activities with cooperative husbandry behaviors. Clients and animals learn through excellent instruction that foundation behaviors tie in to training veterinary and grooming activities in preparation for actual visits. Are you ready? Owners need to be faithful about their "homework." Daily training can be fun and when it is time to visit a veterinary or pet-care professional, the pay-off is huge.